I've got my R1 takeoff headers. Now I'm looking for the quietest 3/4 system. I would have originally assumed Akrapovic, but it doesn't come with a removable baffle. 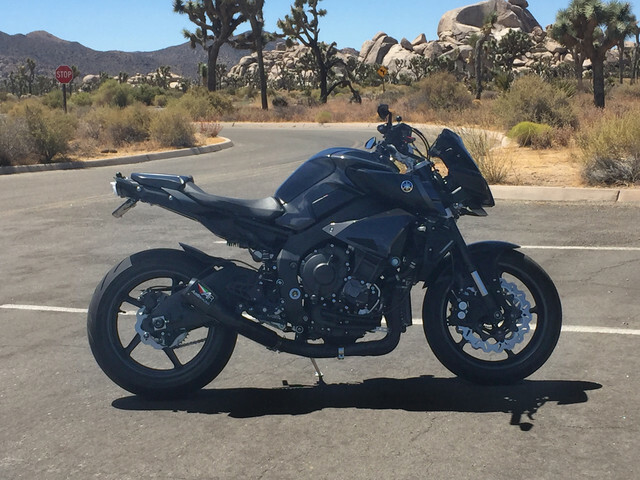 I previously had the full Yoshi system on my FZ1 and had the baffle out most of the time, but would occasionally put it back in. That said, the baffle isn't as important to me as a nice sounding system so Akra isn't out. I'm afraid most of the videos I hear sound like they may be a bit too loud for the neighborhood and my early morning departures. Is there something out there that I'm missing short of the huge Graves muffler? I also know the EVR Graves is an option, but I have seen some weird quality issues on Graves exhaust in the past with delaminating and yellowing of the resin along with some corrosion. Need some help fast! I'm planning on sending my ECU to Nels, since Ivan doesn't have an FZ10 tune yet, which is too bad, because he did wonders for the FZ1. I've had the Yoshi setup and it's a notch down in terms of loudness vs a decat and stock slip on. Cleans up the sound and cuts out the rasp. Baffle made a noticeable difference. 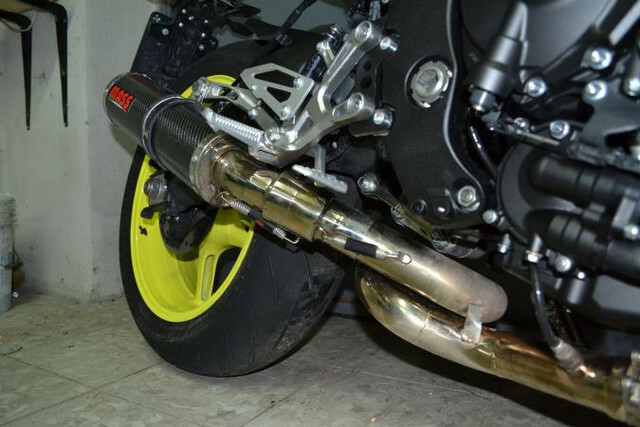 Does the baffle come with the 3/4 yoshimura? Or do you have to get it as an option? I think that my LeoVince is probably the quietest because of the small pre-silencer in the De-cat section, it also has a removable baffle in the can which I have never used. Compared to the Delkevic that I had before it is much quieter but as a friend put it "More beefy" It has a deeper tone with virtually no rasp, the Delkevic was quite raspy. I also like the look of all the carbon. The Hindle 3/4 setup I am running is awesome with the baffle in; it is even comparable to stock in terms of decibels imo, no joke. At highway speeds all I can hear is the engine/wind. But take the baffle out and it turns into a real ear burner. Very deep and throaty and LOUD. It's been the best of both worlds for me. just get the austin racing, use the db cutter and wear earplugs. I have Remus decat and Arrow Indy Race can with dB killer installed. It's in the middle of the road to quieter noise range, nice deep tone and zero rasp, 5x quieter than the Remus decat with stock can I originally had. That setup was literally distracting it was so loud, even with earplugs.